36th Edition : November 2016. Live slaughter prices are weakening very slightly with my monthly indicator rate at Rp42,000 which converts to AUD$4.20 with the weaker Rupiah. The reliable thing about the Indonesian government’s rapidly changing beef policy approach is that it gives me a never-ending supply of subjects to discuss in this report. Here is a beauty to begin with. The Indonesian government recently gave the live cattle importers an ultimatum, either sign up to an agreement to import breeders at a rate of 1 for every 5 feeders imported or no further feeder cattle import permits would be forthcoming. Given the generally unprofitable nature of large-scale breeder production in the Indonesia (with the possible exception of palm oil plantation integration), the importation of close to 100,000 breeders (assuming feeder imports of 500,000) is therefore equivalent to commercial suicide for feedlotters. I have spoken to a number of importers who advised me that ALL importers have signed up to the government’s program! This makes sense in the context of go broke now or delay the process and go broke in two years time so I continued my questioning. 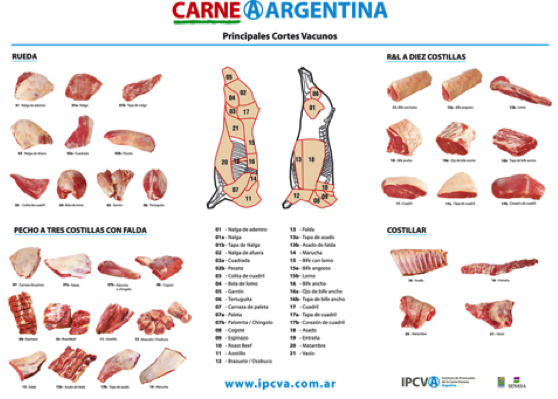 The document they all signed essentially confirms that they will import the appropriate number of breeders according to the formula and agree to the rules for the management of those cattle and, if they fail, then they agree to accept the penalties that will be imposed. The next question was pretty obvious, what are the rules associated with the management of the breeders after importation (or local purchase) and what are the details of the penalties should the importer happen to fail to acquire the appropriate number? You can imagine my shock when I was told that both the management requirements and the penalties are yet to be determined!! These will be decided upon by the government in the coming months and communicated to the importers in due course. I don’t think I need to say any more except to use the expression that I frequently get when I ask an Indonesian friend to explain issues in Indonesia that make no sense to me (of which there are quite a few). They simply say, with a fatalistic grin, “Welcome to Indonesia”. Indian beef appears to be penetrating into the wet markets much more effectively than most observers, me included, had predicted. The general consensus was that wet markets would resist frozen product with the bakso ball manufacturers being the main market for Indian buffalo. At the moment, it looks like the exact opposite has happened. 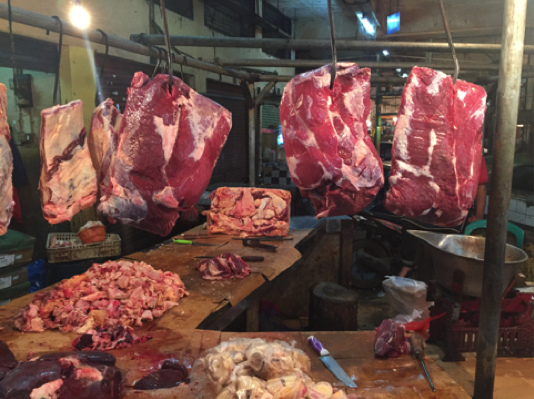 I recently visited wet markets in Jakarta and Bandung where significant quantities of Indian beef are being traded by stallholders that previously sold fresh beef from a mixture of local and Australian imported cattle. Bandung wet market end of November with both frozen buffalo (hanging up) and frozen Aussie and New Zealand beef available. The buffalo product was selling for Rp65,000 to Rp80,000. 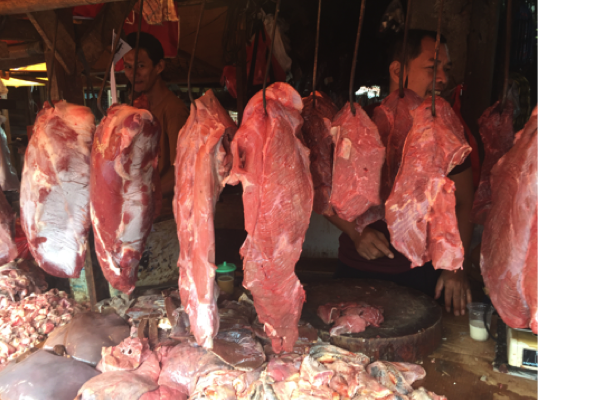 Fresh beef (from Australian imported cattle) was selling for Rp120,000 in the same market. Unfortunately, it is impossible to determine the uptake by the bakso ball makers because there are simply no statistics available. Anecdotal evidence from one bakso maker was that the taste of the buffalo bakso was found to be so different that they chose not to use it despite the price advantage. This taste issue might be overcome in the future but in the short term it looks like the wet market will be the scene for the main impact of buffalo beef sales. Prices of buffalo vary greatly with some selling at the government’s “fixed” price of Rp65,000 per kg while others are quoting a price of Rp110,000 then backing off to Rp100,000 per kg to close the deal. I saw this pricing variation at different stalls in the same wet market. Frozen Indian buffalo in a central Jakarta wet market selling for Rp100,000 / kg. Usually mixed with some fresh offal (on the table). 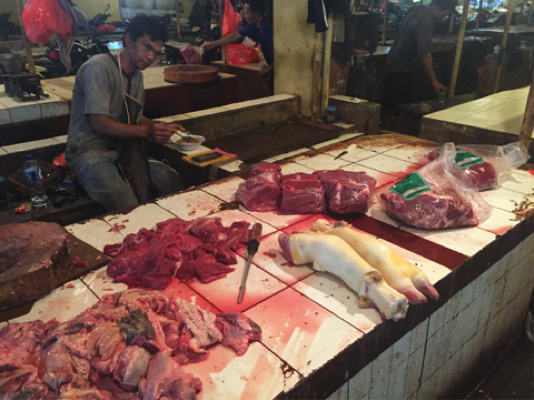 Australian feeder importers report a recent reduction in demand for slaughter stock in North and South Sumatera as well as the Jakarta and Bandung areas by up to 50%. Despite the fact that feedlot numbers are down due to the recent gap in imports, all importers I spoke to were of the opinion that the reduction in kill numbers was the result of the successful penetration of Indian buffalo into the wet markets. 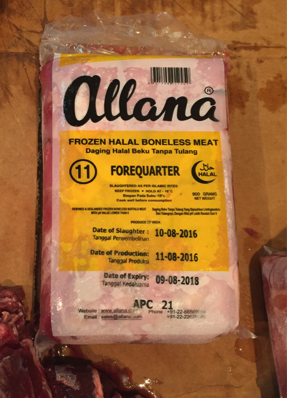 Allana is one of the largest abattoir operators and meat exporters in India. This Indian buffalo (produced by Al- Tamam) offered in a central Jakarta wet market appears to be selling despite the poor presentation by this retailer. Most stalls present a mixture of fresh and frozen product as shown above. East Java open to live imports after closure for 10 years. East Java is one of the major cattle production areas in Indonesia. About 10 years ago, the regional government banned the importation of feeder cattle in order to protect their own cattle producers from cheap supplies from Australia. This policy has recently been reversed with the first shipment of Australian feeder cattle having arrived at the end of November. The importer explained that this is not a one-off with permits for additional shipments in the coming months already in hand. With its large population of beef eaters, East Java has the potential to become a major new market for Australian feeders. I am advised that one of the conditions attached to the new importation is that local farmer cooperatives must be involved in the production cycle in some way to allow them to participate in this value-adding business. In addition, these feeder imports must be accompanied by a certain number of breeders although I understand that the formula when farmer cooperatives are involved is 1 breeder for every 10 feeders. The reversing of the old policy would suggest that the breeder numbers must be down in the East Java region. This new market could be a very useful one for northern Australia for both feeder and breeder sales for the future with the capacity to offset some of the losses to frozen Indian buffalo which is banned in East Java. T3 import permits were a relatively low number at around 125,000. The majority of these will have been imported by mid December. The government has introduced a new permit allocation system in which new permits can be applied for and obtained as soon as the old T3 permits have been fully utilized. This means that an importer who completes his T3 imports by say the 14th of December can apply for the next 4 month permit allocation shipments and be able to commence in December. Numbers of cattle in each permit are not restricted so any importer can request and be granted whatever number they wish. The only catch is that the old rule still applies whereby the importer must import 80% of the permit numbers they are granted or penalties will apply for future permit applications. Prices were generally steady this month with northern rates holding up to a maximum of Dong 72,000 per kg live weight while southern prices ranged from D68,000 for the best quality stock with discounting for over-fat or other out of specification lines to as low as Dong 61,000. I have used D68,000 again for this month’s indicator price. The big issue during November was the ongoing ESCAS auditing process leading to more Vietnamese supply chain suspensions including some of the biggest importers in the industry. While I don’t have the exact figures, I would guess that there could be a total of 50 to 60% of all Vietnamese supply chains now (beginning of December) excluded from Australian imports as a result of a range of regulatory breaches. The timing of these suspensions is particularly unfortunate for the Vietnamese consumers who will be celebrating their Tet New Year festival at the end of January. This annual celebration usually features lots of feasts with family and friends with consumption of beef high on the list of favourite dishes. The end of January should just about coincide with empty feedlots for those 50+% of importers currently out of action. With Indonesia back on stream for large numbers of imports during December and January at a CIF price substantially higher than the Vietnamese importers are prepared to pay then the chances of any significant filling of the remaining 50% of feedlot capacity to support the Tet requirements looks highly unlikely. Government protocols are not in place as yet for the importation of live cattle from South America so the only short term alternative source of cattle in significant numbers will be Myanmar and Thailand. To complicate supply even further, the cease-fire between the Karen and Myanmar government forces has broken down over the control of an area where a major dam is being built. 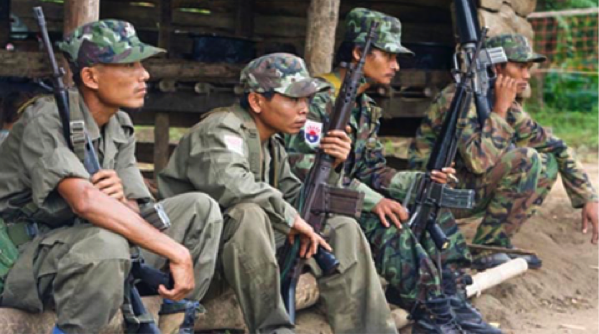 According to the Thai newspaper, The Nation, a Burmese government affiliated border militia and an ethnic Karen insurgency group, the Democratic Karen Buddhist Army is battling for control of the area where the Hat Gyi dam is under construction. Since the fighting is located in the border region where cattle cross into Thailand at Mae Sot, it would seem likely that Burmese exports available for fattening and re-export to Vietnam will be restricted for the time being. Karen fighters control the Burmese border where cattle and buffalo cross the river into Thailand at Mae Sot. Prices in the local market remain steady at around Baht 105 per kg live weight although it is expected that demand will soon build up from Vietnam as Australian cattle import numbers are restricted due to the ESCAS non-compliance issues. As noted above, Burmese imports are likely to be restricted which will put even more pressure on local Thai supplies to be exported to Vietnam. The result could be a spike in Thai prices to satisfy the demand for Tet at a time when most other sources are severely restricted. Good news indeed for the Thai beef cattle producers who have been suffering from low prices since the Chinese border trade effectively closed about 12 months ago. The Malaysian exchange rate continues its steady decline while the live cattle price remains relatively firm. 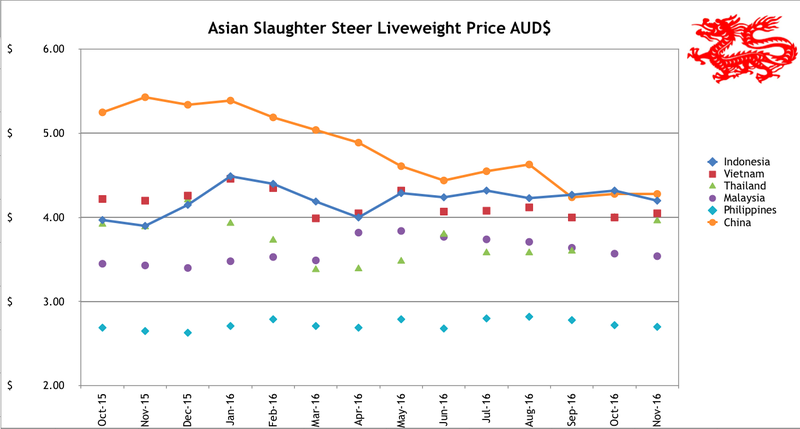 The local live slaughter cattle price in the case of Malaysia is essentially the delivered price for Australian imports. Malaysia keeps their prices down by taking the lower end of the quality scale with cull bulls, cull cows and out of specification slaughter steers as their main import categories. The Peso has weakened a little while local live cattle prices have remained firm. The strengthening economy continues to be the main feature of this market with firm to slightly rising prices for beef in both the wet market and supermarket outlets. Cold weather in China is the traditional time for increased consumption of beef but live and retail prices in both Beijing and Shanghai areas show no sign of movement as yet. 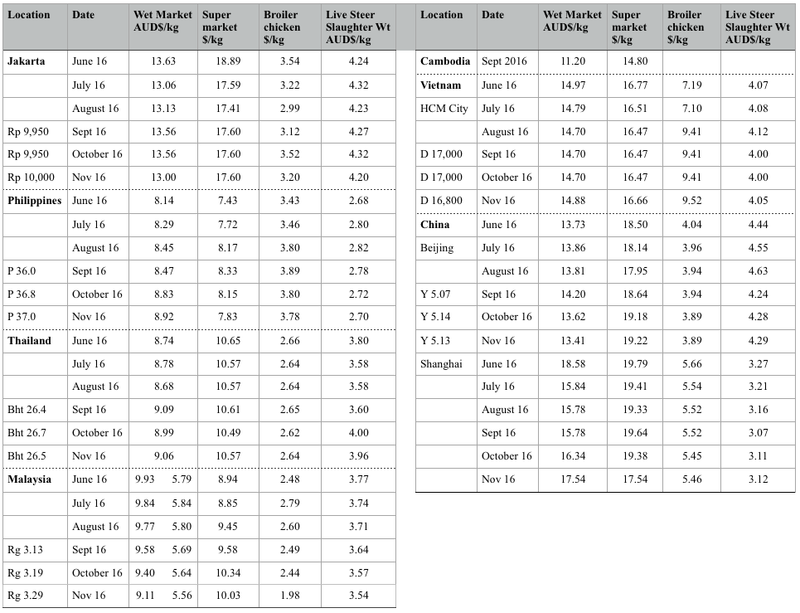 The continued presence in the supermarkets of Brazilian and Argentine beef at the same heavily discounted prices (AUD$7.80 to $9.36 per kg) as last month might account for the absence of the expected annual price rise. This plentiful supply of South American product might also explain the reluctance of live cattle importers to kick off the new trade despite protocols being established and some importers with infrastructure ready to roll. Just wondered if you knew anything about a new weight and age limit for Indonesian cattle imports? Jakarta Globe last Tuesday ran a very vague story about trade minister Eggartiasto Lukita being in intense communication with his Australian counterpart about imported cattle being at least 350kg and 30 months old when they arrive in Indonesia. Australia is supposedly resisting and the story suggests Indonesia will relax the restriction if Australia drops the price of cattle by AU$1. The story goes on to talk about importing 4000 cattle from Mexico. Just wondered if this might be a condition for the breeding females that now have to be brought in under the 20 percent rule for feeders.